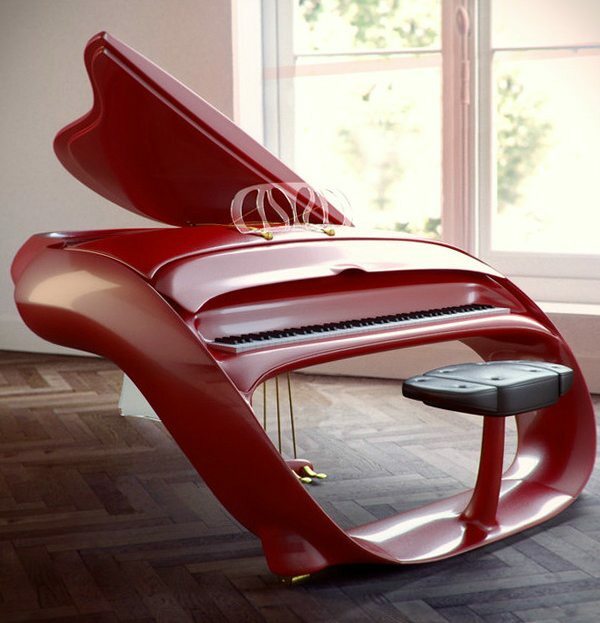 Schimmel Pianos believe that piano playing should be for all the senses. This has prompted Schimmel to produce the Schimmel Art Collection. The pianos in the collection have been designed in cooperation with well known designers and artists, producing individual works of art for piano lovers and lovers of art. 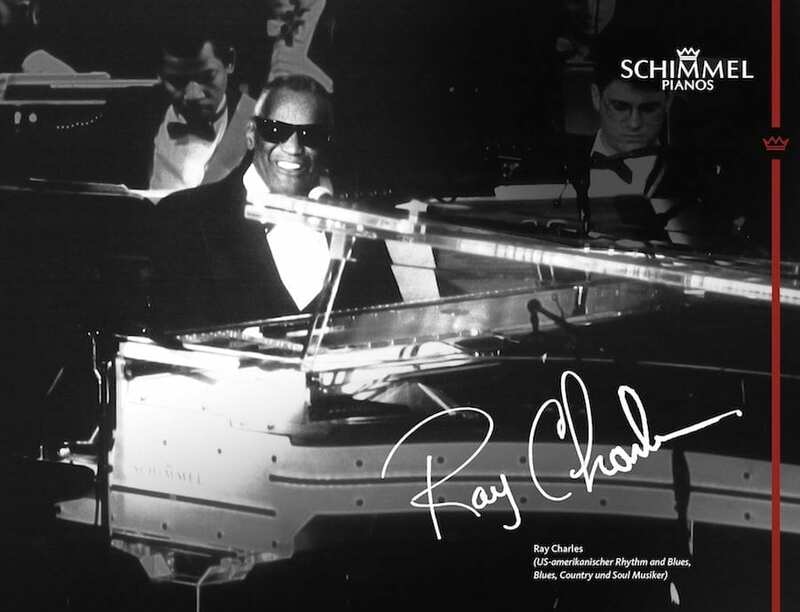 A number of stars have purchased Schimmel’s Art Pianos, including Lenny Kravitz who purchased both a Pegasus and a Plexiglas Schimmel. Eddie Murphy and Prince also purchased Pegasus pianos. 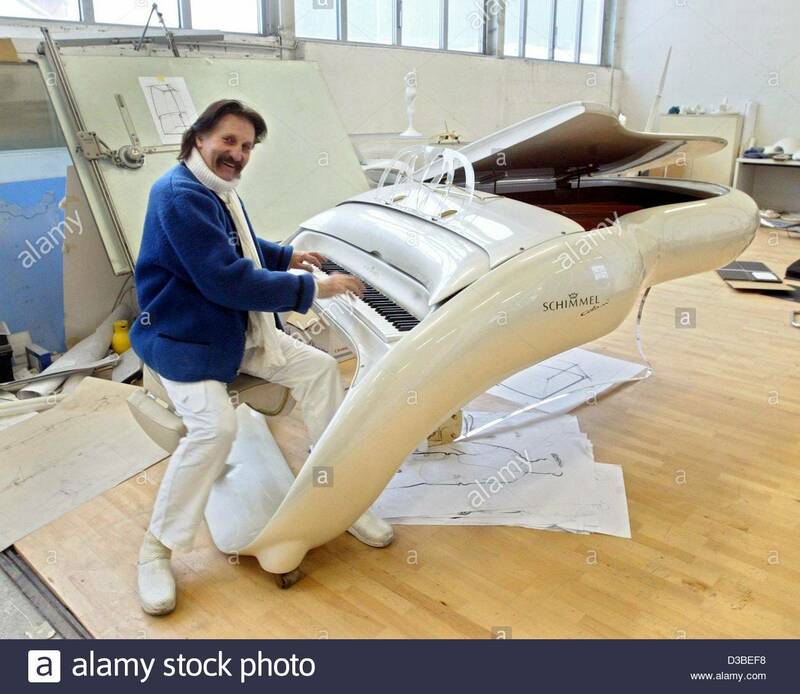 The Pegasus, at first, was just a daring flight of fantasy on the part of the eccentric German designer Professor Luigi Colani and the German piano manufacturer Nikolaus W. Schimmel, who inherited a pioneer spirit from his grandfather and father. But they both made it a reality. It was their vision to free the grand piano, the most expressive of traditional acoustic musical instruments, from its form, which had hardly changed in the past 150 years. Sound and form, form and sound were to permeate these new extraordinary instruments, and the pianist was to be an integral part of them. Prof. Luigi Colani, is regarded as an eccentric among the German designers internationally. He is an aerodynamics expert, so he designed the Pegasus without edges and corners. Gracefully curved for the eye. Sensually rounded for the hands. The Pegasus features an electric-driven lift mechanism that silently raises or lowers the top, as if by magic. The integrated piano stool, which can be extended in width for duet playing, conveys a feeling of complete harmony between the pianist and the instrument. 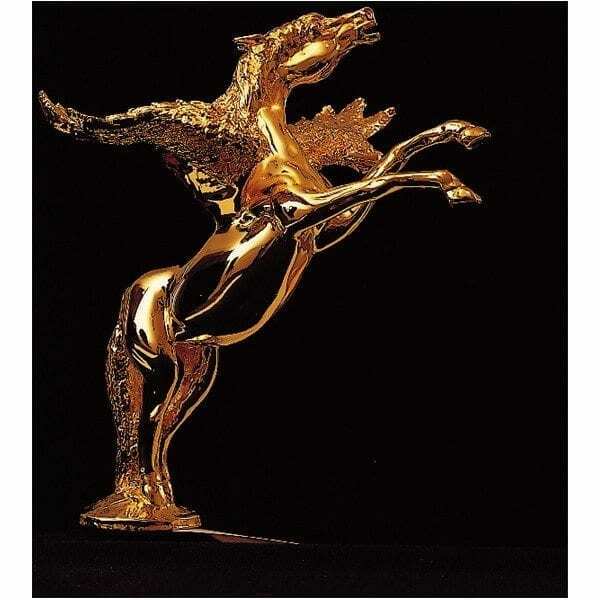 The Pegasus grand can be ordered in any colour available in a high grade automobile lacquer, setting virtually no limit to your personal taste. A piano for individualists. 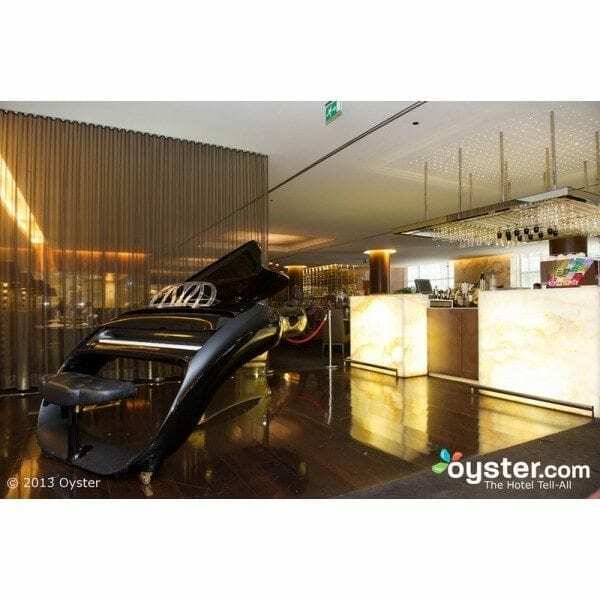 Art Collection pianos are bespoke pianos, produced for each individual. Prices are available from your local Schimmel representative, along with a personal choice of options. Perhaps you would like to select your Art Collection piano in Braunschweig, Germany at the Schimmel factory? It will be an experience of a lifetime. Art Collection pianos are delivered from Germany with unique care. Hence, a delivery date of 3 to 12 months may apply. In 1951, Wilhelm Arno Schimmel caused a sensation by introducing the world’s first grand with cabinetry of transparent acrylic plastic. This model was perfected thirty years later by his son Nikolaus Wilhelm Schimmel. To this day, the acrylic grand stands as one of the company’s flagship models. It is an outstanding achievement in German piano manufacturing, and immensely popular as a concert-tour instrument or as a feature in magnificent homes. Schimmel grands have nothing to hide. They’re all perfection in form, technology and sound. They’re all masterpieces of traditional piano manufacturing. They’re all a symbiosis of art and craftsmanship. Yet no other Schimmel grand model puts this on open display as does the K 213 Glas. The transparency reveals the high quality of its materials and workmanship on all facets. A perfect symbiosis of the keyboard-and-action assembly and the sound-producing portion represent the haute école of the art and craft of piano manufacturing. The cast-iron plate, soundboard and the visible wooden components shimmer in a subdued white, supporting the optical lightness of the transparent cabinetry. Anyone who has ever experienced the Schimmel Grand K 213 in a concert hall, with its shimmering gold coloured trim, reflecting the stage lighting in a thousand multicoloured facets, knows that this unusual instrument is a real eye-catcher. Seen from a distance, the instrument sparkles like a precious jewel; seen from close up, its fine materials and workmanship and technical perfection become clearly evident. 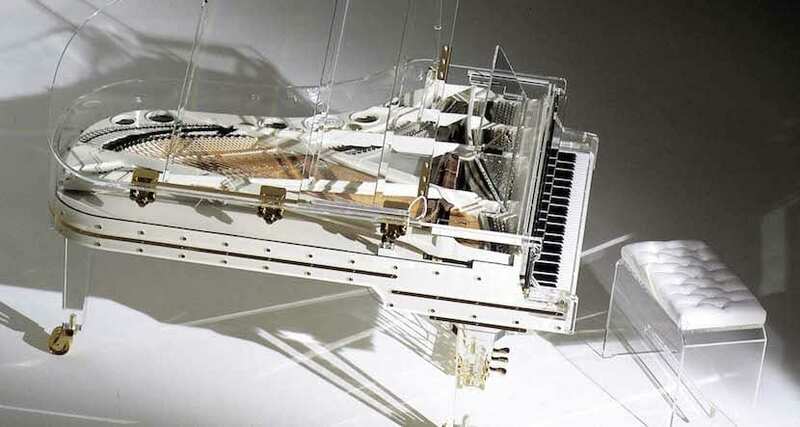 The sound producing portion of the piano is made from traditional materials; only the cabinet is of transparent acrylic plastic. Its crystal clear sound, evident throughout its entire compass, is an inspira­tion to pianists and music lovers alike. Its keyboard and action assembly with its outstanding dynamic modulation capability responds precisely to the finest nuances in touch. And in the midst of all this glasslike beauty, a heavy cast iron plate bears the tons of tension exerted by the approximately 220 strings. This instrument is one of the most significant achievements in over three hundred years of piano manufacturing history. The cast iron plate, soundboard and the visible wooden components shimmer in a sub­dued white, supporting the optical lightness of the transparent cabinetry. If desired, the instrument can also be ordered in colours other than white. There is a black sound producing portion and a gold coloured plate. 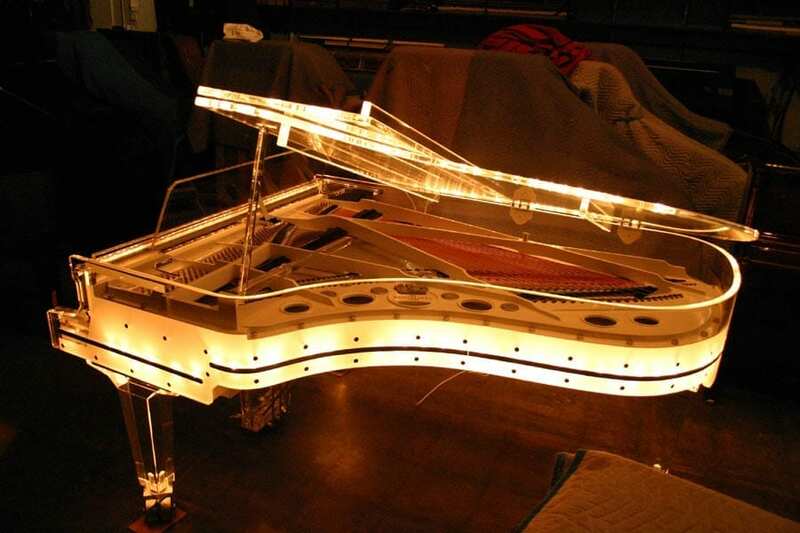 There is an optional lighting system built into the piano, with a dimmer function. The lighting is located behind the gold coloured ornamental strip encircling the sound producing portion, in the top, at the front above the keyboard and in the leg top blocks.